9/2/2009 - Upgrade your Volvo IPS D4 or D6 engine with a Walker IPS Performance Package. Upgrade your Volvo IPS D4 or D6 engine with a Walker IPS Performance Package. This Walker Performance Package includes a washable high performance air filter, that increases the usable filtration area by over 20% compared to the stock paper filter! Improved air flow means better performance when you need it, and helps to optimize fuel efficiency. The kit is packaged with a robust metal filter cover specially designed for high air flow and additional silencing capability, to ensure the quietest ride available. Combine that with a high gloss black finish, and you have a great marine performance package that can be installed in 15 minutes! Want to enhance your engine even more? Be sure to check out the Walker IPS Captain's Package which includes this same performance package but with a high quality POLISHED Stainless Steel MIRROR finish. The Captain's Package also includes two (2) oil filter covers, (1) breather cap cover, a fuel filter side cover, and engine top accent pieces...all stainless steel...all polished to a mirror finish. 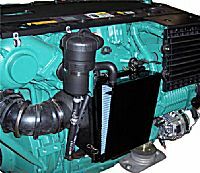 Not many engines have this...read on! Want to be the talk of yacht club...install our ADMIRAL's PACKAGE. Like the Captain's Package, this kit includes engine accent pieces, and a full engine cowling. All stainless steel, polished to a mirror finish. A sea water strainer accent kit is also available as a option. Order now and for a limited time get free ground shipping (Give PROMO Code GG01). Dressing up your engine just got easier! 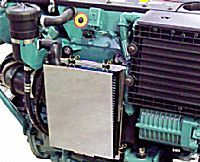 Above engine shown with Admiral's Package and optional sea strainer kit.